Perteet’s creative approach delivers new and innovative ideas that help our clients solve today’s challenges with tomorrow in mind. Seattle’s Elliott Bay waterfront is teeming with activities ranging from goods movement and ferry terminal access to tourism and recreation. Most of those activities occur above or behind the seawall, a structure that was built between 1916 and 1934, and is seriously deteriorated. Perteet is playing a major role in this important project, providing design leadership for the transportation system, including roadways, signal, illumination, maintenance of traffic analysis and design, temporary parking design, local access and circulation, bike and pedestrian design, and channelization/pavement marking and design. In addition, Perteet is supporting construction sequencing, signals and illumination, constructability reviews, and traffic operations analysis and design. Perteet is leading the design of Poplar Way over I-5 for the City of Lynnwood. The improvements will include a new six-lane bridge over I-5 and an overcrossing structure for the Interurban Trail. Adjustments will be made to vertical grades for roadway approaches and intersections at both ends of the bridge, and widening done on Poplar Way, Alderwood Mall Boulevard, and 33rd Avenue W to provide additional left-turn lanes. Extensive operational traffic analysis was conducted using Synchro, SimTraffic, and VISSIM software to access impacts to I-5 ramps and confirm the proposed improvements with WSDOT. Perteet is also coordinating with WSDOT for approval of channelization plans, signal illumination, ITS, and signing designs within WSDOT Limited Access right-of-way. Park Lane is the “heart and soul” of downtown Kirkland. It connects the popular Lake Street retail corridor and waterfront with the Kirkland Transit Center, central civic open space and performance hall in Peter Kirk Park, and Park Place retail and business center. Establishments provide a gathering place during the day and a center for dining and entertainment during the evenings and weekends. Perteet also provided construction design assistance when some connections to the existing system needed to be quickly redesigned due to differing site conditions. This project was awarded the 2015 APWA Project of the Year Award. This project for Community Transit includes the construction of a new transit hub on Seaway Boulevard at the intersection of 75th Street SW in Everett. Design elements include extensive site grading, transit loop recirculating design, flow control and water quality treatment design, transit island and bus shelter design and walkway, crosswalk and ADA design. Perteet is leading the stormwater and LID design engineering team on this project. This includes stormwater design, including two bioretention cells, which are underlain by a plastic detention chambers. The detention chambers are located below and directly adjacent to the bioretention cells, minimizing the footprint needed for water quality treatment and flow control facilities. Due to the increased ridership and a desire to promote further local usage, Community Transit required a new commuter transit hub in the north end of their service area. The resulting transit facility in Smokey Point is more than just a place for riders to catch a bus or waypoint on their way to their final destination. 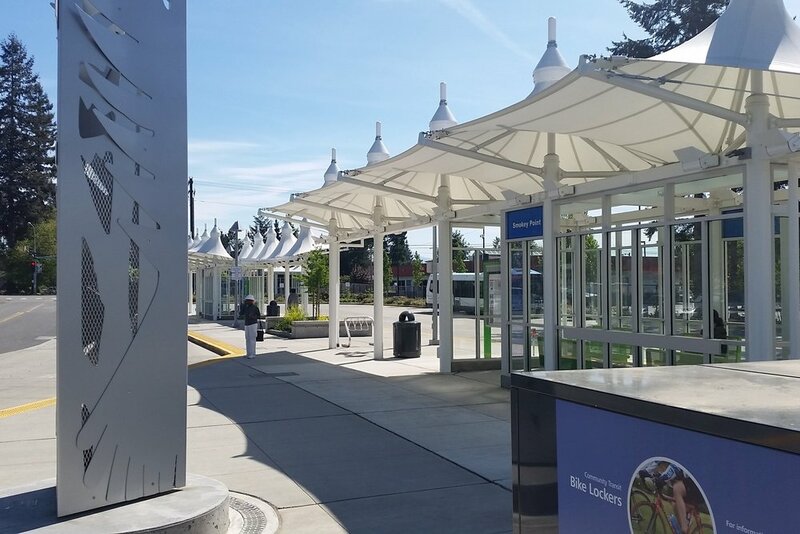 With iconic fabric roofed shelters, broad pedestrian ways, and dense landscape plantings, the facility announces to northern Snohomish County that public transit is part of their lives, not just an urban center luxury. The facility demonstrates Community Transit’s commitment to the environment by incorporating sustainable materials and impact development stormwater facilities with a goal to become the first Greenroads™ certified transit facility in the world. Kitsap Transit is constructing a combined bus base park-and-ride facility, new roadway, and utilities in north Poulsbo. The bus base will provide parking for a portion of Kitsap Transit’s fleet while also providing fueling and bus washing facilities. The park-and-ride portion of the project will create 269 parking stalls and provide off street loading areas for up to five buses simultaneously. A new water main and sewer system were installed to accommodate this three block north base development. Other significant utility infrastructure is also being added to Vetter Road. The project will capitalize on a Washington Department of Ecology grant to implement numerous LID measures throughout the site, including 2.9-acres of permeable pavement parking areas and 3,300-linear-feet of permeable pedestrian pathways, numerous bioretention facilities, infiltration, and Filterra® structures for oil control. Perteet supported the rigorous City of Poulsbo CUP process, local permits, final design, and construction management for this exciting project. Perteet designed an innovative decant facility for Mountlake Terrace Public Works on a tight 0.4 acre existing laydown yard. The improvements included a four cell decant facility consisting of four material disposal bins and a covered stock pile. The City was able to realize these improvements through a design workshop that Perteet facilitated for their staff. We also devised a circulation plan that allowed the material collection bins to be added to the project. Our team partnered with the City to deliver the project in a creative way to reduce overall project costs by having the concrete decant facility and pre-manufactured covered roof system constructed by a contractor while the remaining work elements were constructed by City staff. This phase of the light rail system will extend service from the Northgate Station to the Lynnwood Transit Center with an alignment that parallels I-5. Perteet played a key role in the support of the Environmental Impact Statement documentation for this project as well as taking on the responsibility of utility coordination lead for the preliminary engineering phase of the project. As the rail alignment winds its way up the I-5 corridor, it crosses numerous utilities. 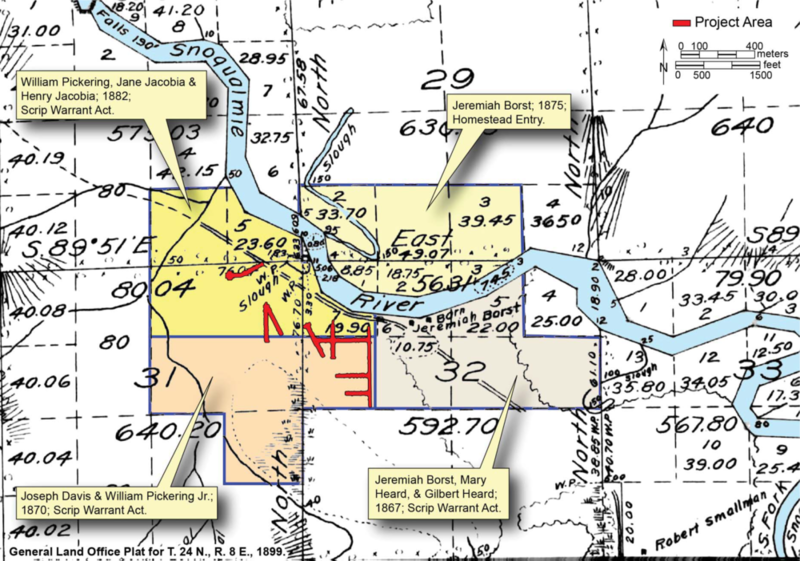 Perteet was responsible for mapping the existing utilities, identifying conflicts with the new rail line, and designing solutions for relocating the conflicting utilities. The work included coordination with numerous utility providers, including independent and municipal water and sewer providers, Seattle City Light, Snohomish PUD, Seattle Public Utilities, cable and telecom companies, and WSDOT. The Town Center Regional Stormwater Facility project consists of a large underground regional infiltration facility designed to promote downtown development by providing flow control and water quality treatment for future development. The facility was constructed beneath the parking lot for the City’s library and the adjacent police and fire department buildings. Construction required complete removal of the parking area in order to complete a 25-foot deep excavation. Careful planning allowed the library to remain open during construction and protected the existing structures throughout the excavation process. The end result of the project is a new, more efficiently configured, parking lot for the City as well as a stormwater facility which will allow full development of the downtown core without further stormwater mitigation. Perteet is providing project management, design services, PS&E documents, permitting documents and bid document support services to the City of Snoqualmie for this large scale infrastructure improvement project. Perteet’s efforts and thoroughness began with completing all field survey work and developing the base maps for fifteen (15) different street alignments throughout the city. These locations coincide with identified needs in the City’s Capital Improvements Plans. The next phase moved into design and included sewer, water, storm drainage, ADA, roadway improvements and private party utility coordination. The sewer portion includes approximately 1,800 lineal feet of new and replacement systems, new services and multiple spot repair locations to improve the system integrity. The water system upgrades and replacements includes approximately 8,000 lineal feet of water main. The storm drainage elements include flow control, water quality and conveyance systems that have approximately 5,500 lineal feet in length. Kitsap Transit’s North Base and North Viking Park-and-Ride is a $12M, 15-acre site, developing a 269 parking stall park-and-ride with a large concrete and steel shelter building, as well as a secure bus base that will facilitate 67 buses and include a fuel and lube building and a bus wash building. The project utilizes federal FTA funding, as well as a Washington Department of Ecology grant to implement numerous LID measures throughout the site, including 2.9-acres of permeable pavement parking areas and 3,300-linear-feet of permeable pedestrian pathways, numerous bioretention facilities, infiltration, and Filterra® structures for oil control. The City of Snoqualmie Tokul Road/SR 202 Intersection Improvements project provides for the improvement of the Tokul Road and SR 202 intersection by reconstruction of the intersection into a roundabout. Perteet provided full construction management services for this project that included clearing and grubbing, removal of structures and obstructions, utility relocation, roadway excavation including haul, storm drainage installation, retaining walls installation, cement concrete pavement, ADA compliant curb ramp and sidewalk placement, hot mix asphalt placement, illumination, landscaping, and wetland mitigation. Perteet was selected for full construction management services for the FHWA-funded Logan Avenue N Airport Way to N 6th Street Project. The $4.4M project consisted of pavement removal and replacement for three City blocks, storm drain expansion, water main and fire hydrant installations, and street and signal lighting, while maintaining northbound traffic through the work zone. Currently, there are no sidewalks on the east side of Logan Avenue N between 3rd Street and N 4th Street. The project will create a continuous sidewalk along the entire east side of Logan Avenue N from the Cedar River Bridge to N 6th Street. An additional signal will be added at N 3rd Street and Logan Avenue N, allowing pedestrians to safely cross all legs of the intersection while also providing safer entry and exit from Renton Stadium. Perteet is leading a team that is evaluating options to improve east-west mobility in the southern portion of Snohomish County. The first phase evaluated potential corridor improvements between SR 527 and SR 99 between Lynnwood and South Everett. The second phase of the project is looking more closely at specific improvements that will improve mobility in the southern portion of Snohomish County by creating better connections to future Sound Transit High Capacity Transit stations. Costs for the proposed improvements ranged from a low of $121M to a high of $993M. Perteet worked with the City of Wenatchee on the design of pedestrian improvements in downtown and neighborhoods adjacent to schools. This federally-funded project includes the design of two intersections with Rectangular Rapid Flashing Beacons (RRFB). Each location is along a school walking route. One of the RRFB locations will include signalization of two crosswalks. This requires a unique design to accommodate all users. Our project installed RRFB assemblies on both crosswalks along with push buttons for all four corners. This allows school children to use either crosswalk and still receive the benefit of the flashing indications. These locations also included additional conduit and junction boxes for future use of the RRFB by bicyclists. A HAWK beacon, or High-intensity Activated crossWalK beacon, will be installed to connect neighborhoods to key pedestrian generators. The City of Tukwila selected Perteet to assist the City in modernizing the existing numerical method they use to prioritize residential street segments for capital improvement. Perteet developed a prioritization array which blends the City's equation-based method, geometric data compiled from Google Street View, new salience variables for transit and school walking routes, and an enhanced level of interactivity which allows the City to experiment with the data by "...placing a thumb on the scale". In addition to the prioritization array, Perteet developed improvement option info sheets for 190 different residential street segments comprised of existing conditions, opportunities and constraints, preliminary design recommendations, and planning-level cost estimates, all bound into a single volume. We also developed an interactive GIS-based map tied to the ranking and cost data in the prioritization array. Perteet’s new Energy Service group provides Engineering and Design services for electric Transmission and Distribution facilities. Our services include design for low voltage services to end users. We also do the engineering to build or rebuild the overhead poles, wire, transformers, and switches; and, the underground cables, connection vaults, and pad mounted switches and transformers which make up the distribution systems in virtually every commercial setting and residential neighborhood. We also complete the engineering for the construction and refurbishment of high voltage transmission lines which move bulk electric power from generation facilities to load centers, from point to point on the interconnected grid, and into large industrial sites. Perteet’s archaeologists completed cultural resources assessments for a new roundabout, road locations, and a wetland mitigation site near Snoqualmie Falls. Because of permitting from the US Army Corps of Engineers, the project was subject to Section 106 of the National Historic Preservation Act. Perteet staff helped the City navigate its consultation with affected Tribes and helped develop a memorandum of agreement. In close coordination with Perteet’s construction management team, archaeologists monitored construction. Perteet’s cultural resources team conducted a review of areas proposed for infrastructure improvements within the City of Snoqualmie. They carried out extensive background research to identify previous cultural resources investigations and known archaeological sites within the project vicinity by reviewing historic maps and published historic, ethnographic, and environmental information. Based on the background research, they developed a probability model for the planned construction to encounter buried cultural material. Perteet environmental planning staff prepared a park and trail masterplan and all related environmental assessment documentation (including EIS compliance documents, wetland delineation, and SEPA) and worked in collaboration with Everett Parks, Forterra, and the local community to design and implement a trailhead, trails, a low-impact wetland boardwalk, and native plant restoration for a 3.6 acre natural open space along Silver Lake Creek. The project includes 1,600 linear feet of soft-surface and ADA accessible trails to provide a passive natural open space experience for the local community. Perteet is providing long-term performance monitoring of approximately eight acres of wetland creation that included grading and planting, stream habitat restoration, a pedestrian trail, and a pedestrian bridge associated with Clear Creek. Prior to joining Perteet as Environmental Manager, Jason Walker provided permitting for Federal Individual 404 and 401 permits for 1.3 acres of wetland fill, alternatives analysis preparation, Section 7 ESA consultation, BE preparation, stakeholder and community outreach, off-site mitigation design, pedestrian trail design, and obtained HPA for removal of three fish blockage culverts. Perteet environmental planning staff managed local, state, and federal regulatory processes associated with natural resources/sensitive areas for the $15.5 million Bothell Crossroads project, including successful issuance of Clean Water Act 404 and 401 permitting, HPA, in-stream habitat enhancement and wetland mitigation. Perteet also provided general engineering and design for this major redevelopment of two intersecting roadways in Bothell as part of the City’s Downtown development plan. The project had major implications for streams, drainages, wetlands, the Park at Bothell Landing, and the Sammamish River. Perteet led the design of the initial Horse Creek Mitigation Plan. 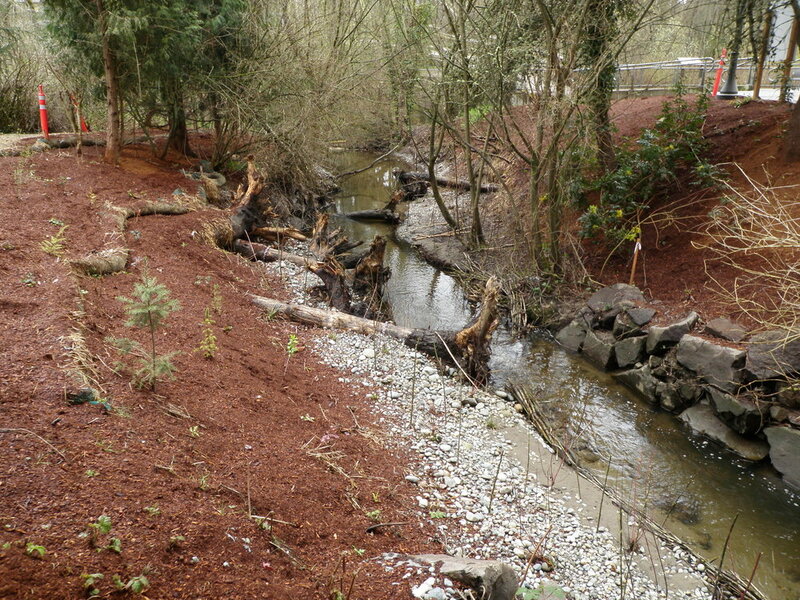 Habitat enhancement components included daylighting and restoring approximately 300-feet of urban stream channel by removing an existing culvert and reconstructing the channel with large woody debris (LWD), gravels, and other features for in-stream habitat. Perteet has been retained by the Tulalip Tribes Office of Emergency Management to update the 2004 Comprehensive Emergency Management Plan. This project required review of current emergency management programs, analysis of existing deliberate planning efforts, and evaluation of the community’s response capabilities. Under Kirk’s guidance, the community has conducted operational exercises that have re-established community wide engagement and energy for a deeper approach to deliberate planning. This project was required to be developed under the framework of the Department of Homeland Security’s National Response Framework and the National Incident Management System. Regular project goals and objectives were established with the client project manager that ensured planning updates were established compliant with all Federal planning guidelines. Perteet is currently providing on-call services to the Chelan County Public Works department to prepare a strategic disaster emergency plan, including emergency response planning and Continuity of Operations planning. Our team is also working with staff to develop an outline for shaping a department specific Emergency Operations Plan and Continuity of Operations Plan to include GIS centric telemetry systems to measure stream flows and precipitation rates. In 2015, the Clark County Public Works Department instituted the Resiliency Initiative, to facilitate the planning, facilitation and public outreach of the Resiliency Initiative effort of the Clark County Public Works Department. The Resiliency Initiative, as part of the APWA Accreditation program, was to determine the level of effort needed to evaluate the department’s past emergency and disaster performance and determine what deliberate planning efforts should be implemented to improve. The department is a key player in the overall mission of the region’s Emergency Management capabilities. Perteet’s role in this project was help the client to test the core capabilities that are supported by Public Works in the overall Clark County Comprehensive Emergency Management Plan’s Emergency Support Functions. Perteet provided a technical memo and analysis on how best to improve the initial emergency response and short-term disaster recovery capacities of Clark County Public Works. Copyright © 2016 Perteet - All rights reserved.